True Blue Animal Rescue’s “Animals Bridge Love and Education (ABLE)” program is run by Melanie DeAeth. Melanie is an educator and reading specialist trained in dyslexia intervention and special education and she is also certified and trained as a behavior specialist. On the animal side of things Melanie has a degree in Animal Science, Horse Husbandry and has worked with horses for over 30 years (including years giving riding lessons). Her passion for horses began as a child when she found comfort while working with and riding horses. Melanie learned from experience that horse interactions build self-esteem and confidence and she loves sharing this opportunity with others. True Blue Animal Rescue is a 501c3 non profit organization that takes in horses, dogs and cats, rehabilitates them and finds them new homes. Melanie and her husband Dale began True Blue Animal Rescue ten years ago in an effort to put an end to abuse, neglect and overpopulation. In True Blue Animal Rescue we believe that the key to ending abuse, neglect and overpopulation is through education. To help with this we began a program called ABLE (Animals Bridge Love and Education) where children can help with and learn about our rescue animals. We know that this helps develop better pet owners and future advocates for animals but these interactions also develop compassion and empathy in our young people which helps stop bullying and recurring child abuse by teaching a different way to interact through our animals. Every animal in the ABLE program has been abused and some have disabilities. Learning about what these animals have overcome helps children overcome some of their own obstacles while building their self-esteem. Children that come out to an ABLE session learn about our horses and dogs. They can participate in some animal care such as cleaning a stall, brushing horses and bathing dogs. We also offer the opportunity to work with horses in our round pen and arena and a chance to ride horses as well. Finally, we have a tractor drawn hay ride for the kids to enjoy after a hard day of work and animal play. The stall cleaning and animal brushing is a small portion of the experience. 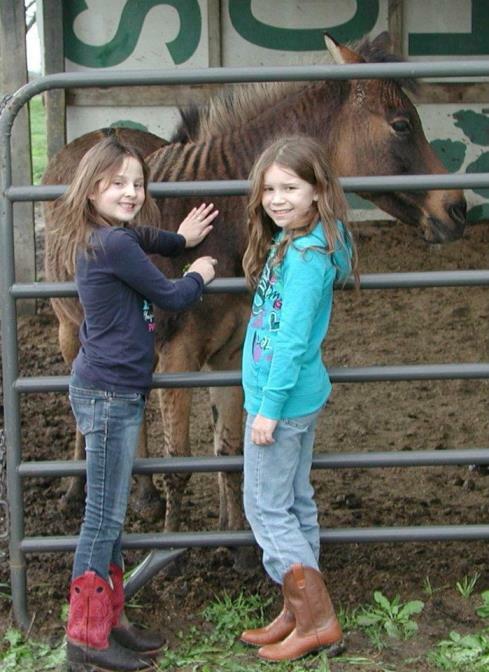 We believe some participation in animal care lets kids know that it’s a lot of work to care for animals. The rest is lots of fun and self esteem building time. If you are the coordinator for a camp or kids program and are interested in bringing your group out for an ABLE visit, please contact us! We have had church groups, scout troops, school field trips, and treatment centers bring children to participate in the variety of programs that we offer under the ABLE umbrella. Sessions are tailored to fit each group. This is part of our community outreach and we are happy to provide this to children in our community. You can email us at help@t-bar.org or call (936) 878-2349 for more info. Click here to read more about ABLE Camp initiative! 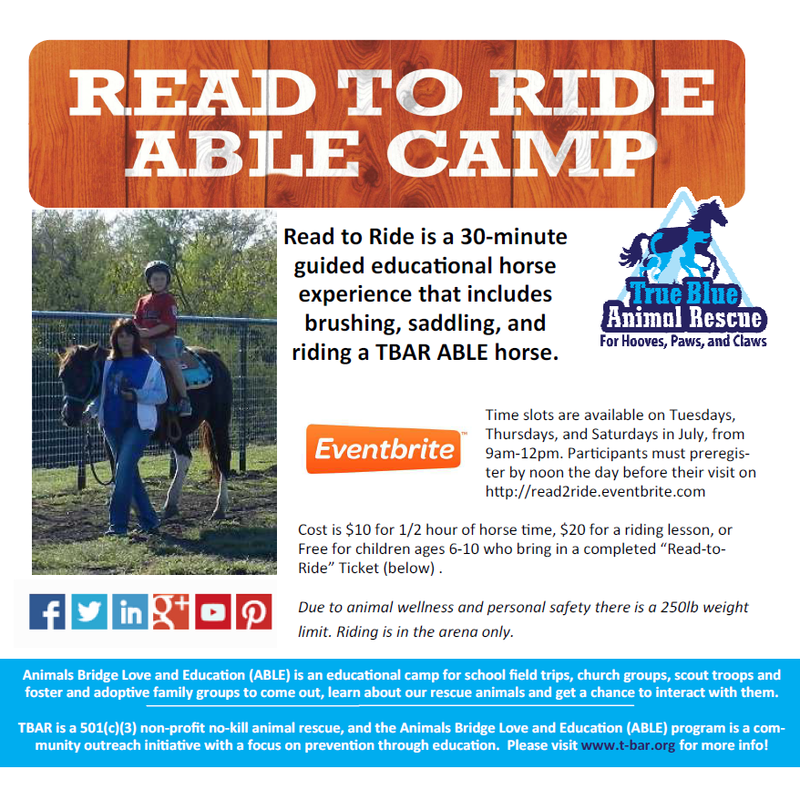 Read-to-Ride is a 30-minute guided educational horse experience that includes brushing, saddling, and riding a TBAR ABLE horse. Cost is $10 for 1/2 hour of horse time, $20 for a riding lesson, or Free for children ages 6-10 who bring in a completed “Read-to-Ride” Ticket (one time only). Register on EventBrite to reserve your spot and then pay on site the day of your reservation. You can also call (936) 878-2349 to reserve your spot. See our Camp Recaps Here!